« Episode 23: Steampunk primer with Dr. Gintia and Sir Ernest! Star Trek meets everyday finance: A review of Checks in the Mail’s checkbooks, registers and more! One of the hopes that I had in the back of my mind when I first created this site in 2011 was the opportunity to be contacted by a company, and being asked to do product reviews for them. A few years went by, and no offers came. Then the site grew! And wouldn’t you know it, I got an email from the company Checks in the Mail asking if I would be interested in doing a product review of Officially Licensed Star Trek products! Checks in the Mail is a company that specializes in Licensed products, including items like checks, organizers, return address labels, etc. with Licensed images on them, such as Star Trek, Hello Kitty and the like. About a month before I received the invitation to review some of their products, I found them on the StarTrek.com homepage and decided to checked them out. And I thought they were pretty cool. Fast forward a month or so, and here I am writing a review for them! I honestly thought that they would send me one product to review, so I was very surprised when I received a box of three items! The items received were the Star Trek Quogs Sheet Labels, the Star Trek Classic Leather checkbook Cover, and the Star Trek Badge Debit Caddy. So, let’s get to the reviewing! The Star Trek Quogs Sheet Labels! The first thing that I saw after I opened the box were the Star Trek Quogs Sheet Labels. The bright coloring is what first caught my eye. Not in an annoyingly bright kind of way, just the pop of color. On an envelope, it will easily catch the attention of the person receiving your letter. The over-exaggerated styling of the characters is fun to look at and definitely captures the essence of each without going overboard. The quality of the labels are, to be honest, a lot better than what I was expecting! I’ve had experience with custom labels in the past, but these are damn fine labels, if I may be so bold! They easily peel off the sheet, and unlike others I’ve gotten, they actually come off the sheet! No fighting needed! And if you did need to fight, we all know that Kirk would win. He always wins. I mean, he’s Kirk! The Star Trek Classic Leather Cover! 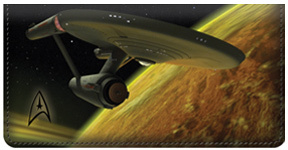 The next thing that I looked at was the Star Trek Classic Leather checkbook Cover. This was a pleasant surprise to have gotten! As with all things leather, I compulsively sniffed the checkbook cover, and yep! Smells like real leather! This was one of the items that I was thinking about purchasing for myself when I first found Checks in the Mail, and no, I had no say in what products I was receiving. The print quality on this cover is well done, and not cheaply stuck on like some other companies do. The leather is soft, so it shouldn’t crack or break for many, many years. As you can see in the above pictures, the front features the classic Constitution-class U.S.S. Enterprise in orbit of the planet Gamma II from the season 2 episode, “Gamesters of Triskelion.” (Thank you, Blog Monkey Neo!) The lighting of the ship is just spectacular, isn’t it! I’m glad they chose such an image for the cover! 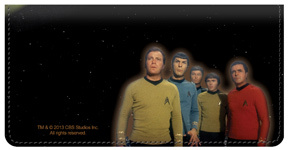 And, the back cover shows Kirk, Spock, McCoy, Chekov and Scotty as seen in the season 3 episode, “Spectre of the Gun.” (Thanks again, Neo!) If you use checks a lot when you go out, or just want to Trek up your home office, I highly recommend! 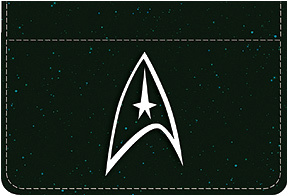 The Star Trek Badge Debit Caddy! The final item pulled out of the package is the Star Trek Badge Debit Caddy featuring the classic Delta symbol with the command insignia floating against a field of stars! One fun thing about this caddy, is the reaction that I had when I opened it up and saw that it come with its own pen! I think it was something to the effect of, “Oh! Hey! It comes with a free pen!” It seems like it’s made out of a nylon-like material, so it should last a long while. The printing on the caddy is the same quality as we see on the checkbook cover, and the image quality is very good! It can hold several cards and has a special ID window, so you could easily use this as your wallet if you never carry cash around. And it comes with a free pen! Blog Monkey Neo helped with this review, and he, Mrs. Uncommon Geek and myself all agree that these items are good quality and feel that Star Trek is proudly represented. I am honored that Checks in the Mail came to our small, humble site to ask if we would be willing to review their items, and the affiliate marketing rep that I have been talking to getting this set up has been nothing but friendly and professional and an all around awesome person to work with! And if customer service is anything like her, then I have no doubts at all that you will have an equally awesome ordering experience! You will see the items featured in this review and more! *NOTE* This review is the true and honest opinion of The Uncommon Geek himself with input from Mrs. Uncommon Geek and Blog Monkey Neo. Trek on, True Believer!